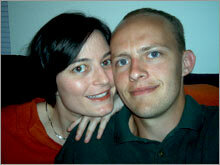 The Orlando-based couple thought they were in a bubble. Are they in a bust? NEW YORK (CNNMoney.com) -- When Casey Young and his wife Jaime Ballanco put their Orlando house on the market back in March, they had no clue that the property would not sell. As far as they were concerned, Orlando was still bubbling. The couple has had next to no interest in this 4-bedroom contemporary. 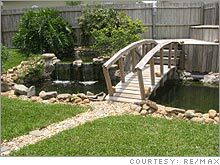 Young thought adding this Koi pond in the backyard would boost value. After all, home prices were supposedly growing in the neighborhood of 20 percent a year. 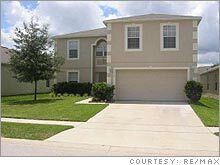 But what the top-line statistics masked was that a slowdown was already underway - from the fourth quarter of 2005 to the first quarter of 2006, the median home price in Orlando fell 0.5 percent. Young and Ballanco have a particularly vexing problem having just contracted to buy a new house. "We're planning on starting a family someday," says the 30-year-old Young, who builds simulation software for a defense contractor. "We wanted a bigger home - with a pool." The new house cost $562,000 so they were really counting on profits from the old place to help. They had bought their current four bedroom, two-and-a-half bath, 2,861 square foot contemporary new on the last day of 2002, paying $167,000. Young had spent a lot of money and sweat improving the place over the years, putting in tile floors, chair rails, crown moldings and other amenities. The house has formal living and dining rooms and Young also installed a Koi pond in the backyard with a rustic Japanese bridge. Believing that the house would sell itself, Young decided to list it through Flat Rate Realty, a for-sale-by-owner operation that will place a property on the multiple listing service for a fee of $99. Home values in Orlando had nearly doubled in the years he owned the house, according to statistics from the Office of Federal Housing Enterprise Oversight, and with all the improvements he made he felt it was well-priced at $402,000. "My house is priced very low compared to other comparables in the area," says Young. But the only calls he was getting were from realtors, who wanted to act as his agent. After weeks of no action, he hired one of the agents - The John Muccigrosso Team - which had a reputation as a very active seller and had done well in down markets, according to Young. They re-priced the house, lowering it to $369,000 and then to $349,000. They've had open houses that nobody attended; run advertisements that elicited no responses; and sent out flyers that were totally ignored. In all its months on the market, the house has drawn only two lookers. "One sounded like he was just doing research. He may not have been a legitimate buyer," says Young. And the other couple just walked away. The biggest issue may be a glut of listings. "Lots of investors swooped in buying homes when the market was hot. Now they are dumping them. My agent tells me that's where the glut comes from." The number of homes on the market in Orange and Seminole Counties has skyrocketed, from 4,473 in July 2005 to 19,827 in July 2006, according to raw data drawn from Mid-Florida Regional Multiple Listing Service Hotsheet reports. To know the problem is no consolation to the couple, who are increasingly feeling the stress. They have to make a decision soon about whether to go ahead with the purchase and hope they'll sell the old house, or give up the new place and lose their $28,000 deposit. They're due to close Oct. 24. "I absolutely need the profit from my old home to afford the new one," says Young. "Even with rental income from one of the homes, there's no way I can afford both mortgages at the same time. The Eaton's struggle to sell their Carbondale, Illinois home. Terry Likens and Duane Przybilla struggle to sell in Eden Prairie, Minn.
Latest home prices for 150 markets.